A park usually improves a neighborhood. But what happens when your neighborhood is destroyed to build a park? About 1600 people lived on the land that would become Central Park. The largest settlement was the well-established community of Seneca Village. Seneca Village was first established in 1825 when African-Americans acquired property in the area. By the 1850s, about two-thirds of the village’s residents were of African descent, with most of the others being Irish-Americans. An 1855 state census reported approximately 264 people living in the community, which also contained churches, cemeteries, and a school. 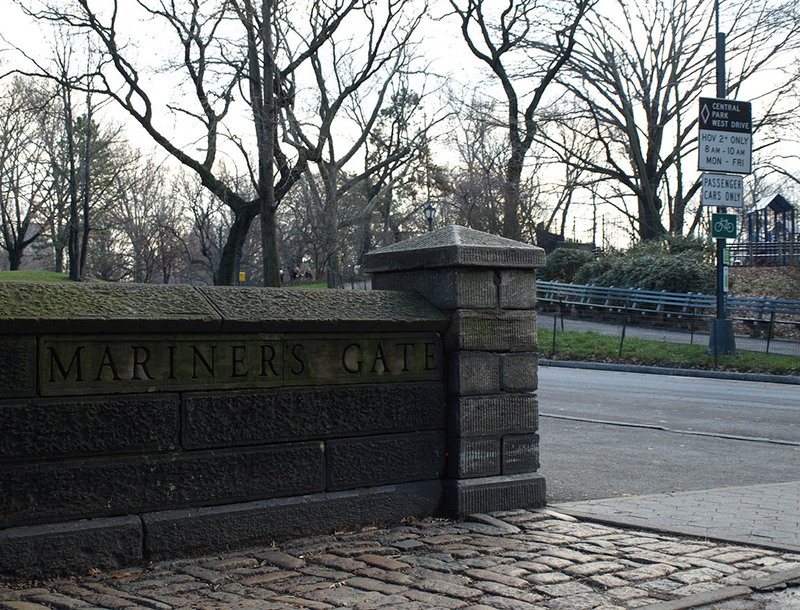 The village was near what is now the 85th Street entrance on the western side of the park. Before the park was built, 85th Street continued another block eastward. This was one of the streets of Seneca Village. The Columbia University website has a map and directions that are very helpful in understanding the location of the village grounds. Up the hill, part of a stone foundation can be seen sticking out of the ground. Looking southeast from this point in 1855, you would have seen a number of homes. Today a park road winds through trees and grassy rolling hills . Often denigrated as “shanties” by contemporary commentators, houses in the village were typically permanent structures that offered better living conditions than could be found in many downtown tenements. They included cabins with multiple rooms and floors. Many residents also had gardens and barns. Seneca village was bordered to the east by the Croton Receiving Reservoir, a rectangular structure with walls that rose high above the ground. The reservoir was drained in 1930 and the Great Lawn was established on the land soon afterward. 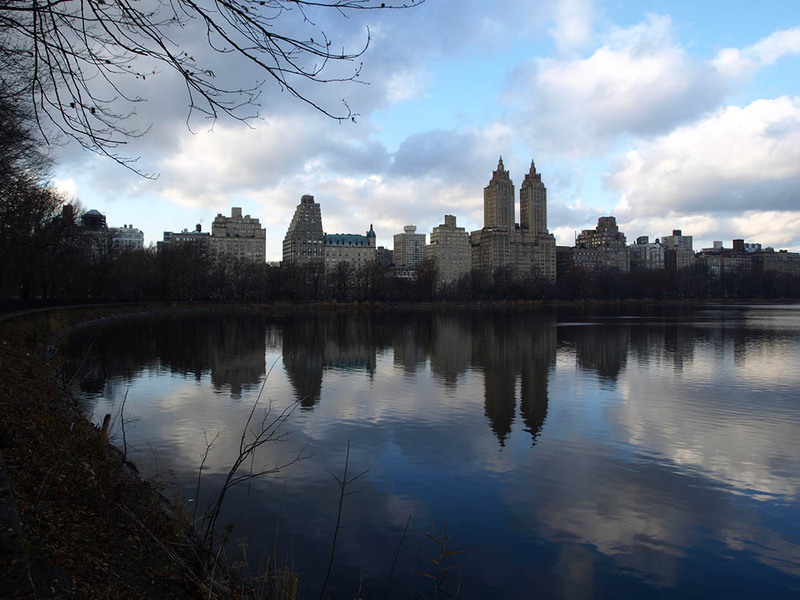 The Jacqueline Kennedy Onassis Reservoir was constructed with the park and sits below ground. The southwest corner of the reservoir covers what was the northeast corner of Seneca Village. The idea for a large Manhattan park emerged in wealthy New York social circles in the late 1840s. Inspired by large parks in European cities, they hoped the park would improve the lives of all city residents by providing a healthy space for moral recreation, but they also wanted a place to accommodate elegant carriage drives and to reflect the cultural greatness of the city. 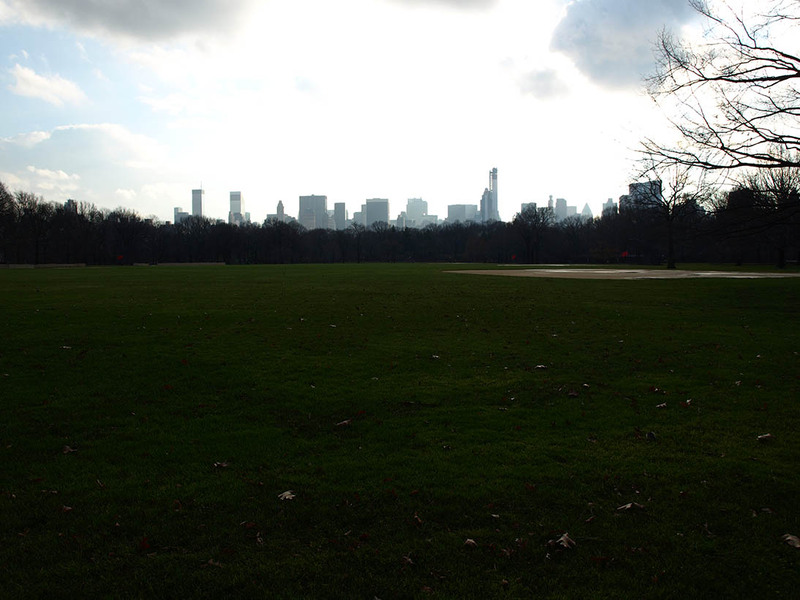 In their history of Central Park, Rosenzweig and Blackmar argue that a desire to displace poor uptown residents was a major influence on the decision of where to locate the park. In the 1840s one observer described the area as a “waste” filled with “poor and wretched people of every race and color and nationality” who “had no regular occupation,” and described alleged sexual contact between blacks and whites in terms of outrage. Maybe the park designers just didn’t see the settlements as worth obstructing the creation of a grand, idealized, and perfectly rectangular reflection of American culture and its ability to tame nature but still benefit from natural surroundings. After a series of political battles, mostly among factions of the wealthy with various interests, construction began in Central Park, a project that was seen as creating numerous jobs that were needed in the economic downturn. 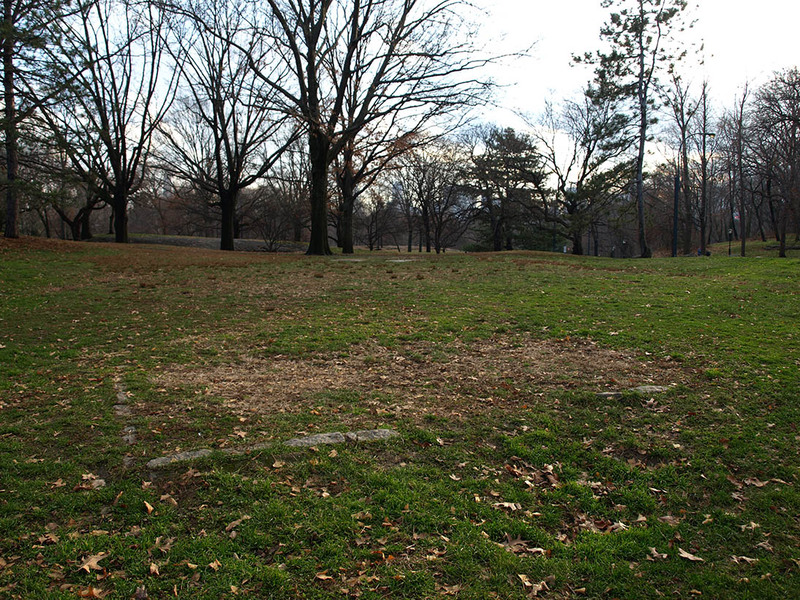 Through the power of eminent domain, the city removed Seneca village in 1857. Although Seneca Village landowners did receive more money for their property than they had purchased it for, the community life they had built was gone as the residents scattered. In 2011 the Seneca Village Project made its first archeological excavations of the village grounds. The stories of the Seneca Village residents still have much to teach us about life in New York in the mid-nineteenth century. Disputes over how to use the land continued long after Seneca village was gone. The park is not only government land intended for the recreational benefit of the public in a densely-populated city, but is also a symbol of prestige. Numerous issues were bound to come up as the park was managed through the years and became a social space. 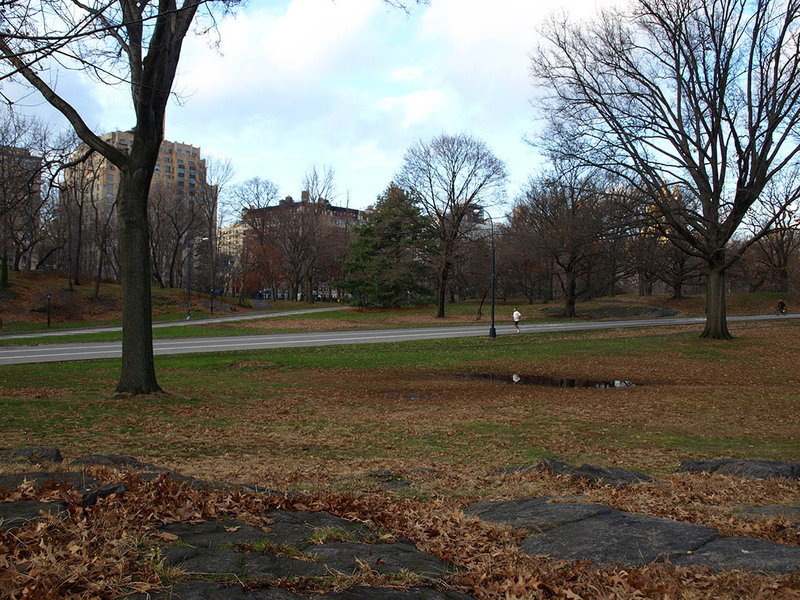 Central Park can also be used to understand how the city was made and how the public – numerous people with divergent interests – have been served. Population: Roy Rosenzweig and Elizabeth Blackmar, The Park and the People: A History of Central Park, Ithaca: Cornell University Press, 1992. 60, 64-65. Establishment of village and demographics: Seneca Village Project Website, Columbia University. Accessed December 19, 2012. Index and History. Buildings: The Park and the People, 68-70. Croton Receiving Reservoir (Lower Reservoir): The Park and the People, 439. Motivations to build park: The Park and the People, 30,54. Negative views of residents: The Park and the People, 63, 67. Job creation in construction: The Park and the People, 57. Location: Interactive Map, Seneca Village Project. Eminent domain and removal: The Park and the People, 59. Index, Seneca Village Project. 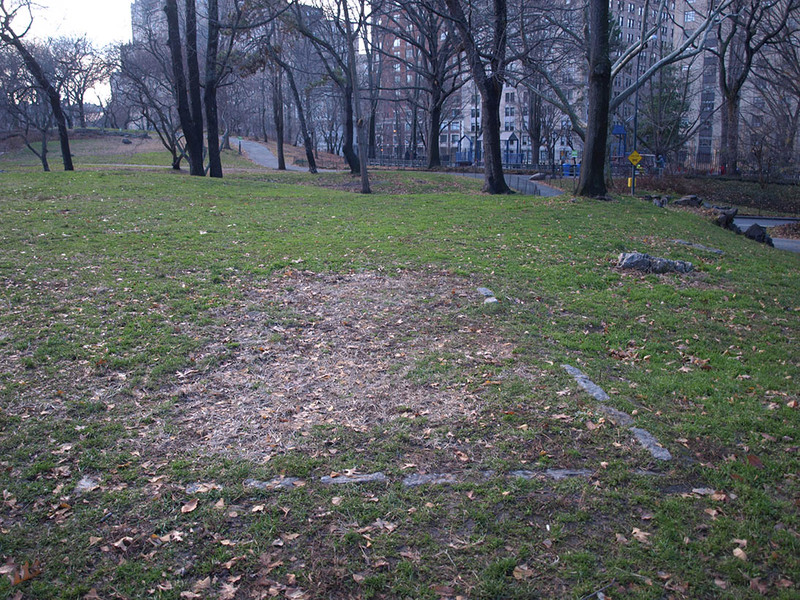 Compensation of Seneca Village landowners: The Park and the People, 89. Archeological Excavation: The Excavations, Seneca Village Project. We’re working on a video where we travel to the grounds of the old Stelton Ferrer Colony with a graduate of the unique school that once anchored the community. The video is currently in the editing process, and we’re working with an experienced producer to give it some extra awesomeness! Right now you can see how Ryan found an old trolley line between Princeton and Trenton. The Ramapo Mountains are a rugged line of peaks and ridges rising about 1000 feet above sea level in northern New Jersey and southern New York. The Precambrian metamorphic rock that they are made of has lasted more than 600 million years while the softer rocks around them eroded away. 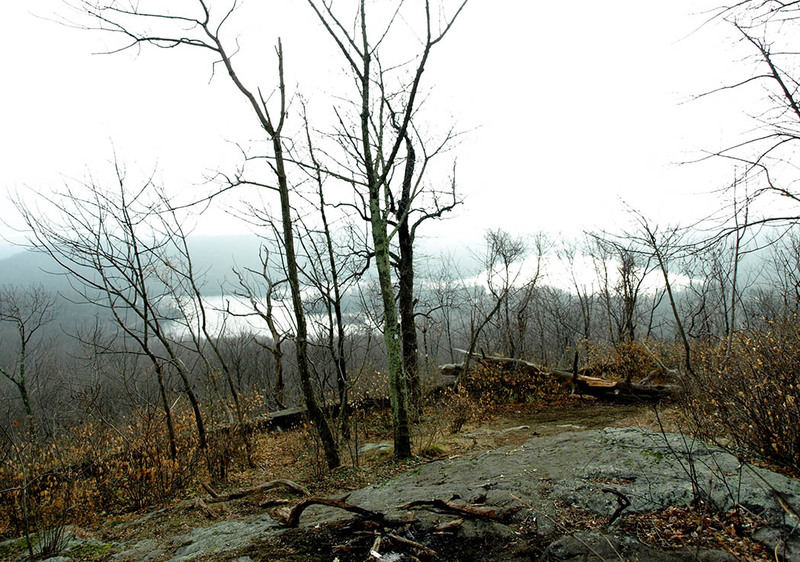 The rugged Ramapo terrain prevented much early development, and the mountains have served countless people looking for a break from the more crowded parts of North Jersey. 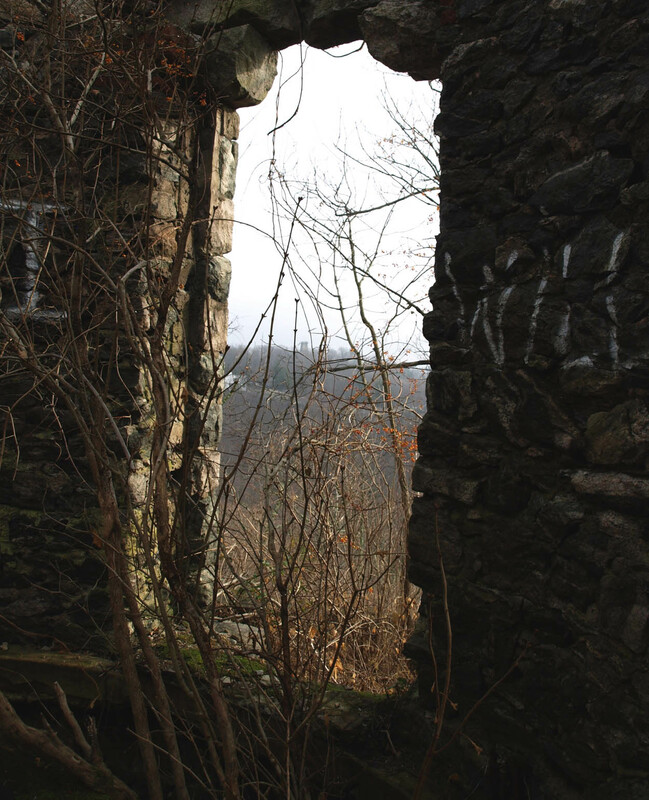 On Sunday, Darian and Helen went to explore some of the structures they left behind. We parked at the upper Skyline Drive lot. That’s the one farther from I-287, because who wants to start a hike right off the interstate? We headed west on the short white and red trail, made a right on the Cannonball, and a quick left on the Castle Point Trail. 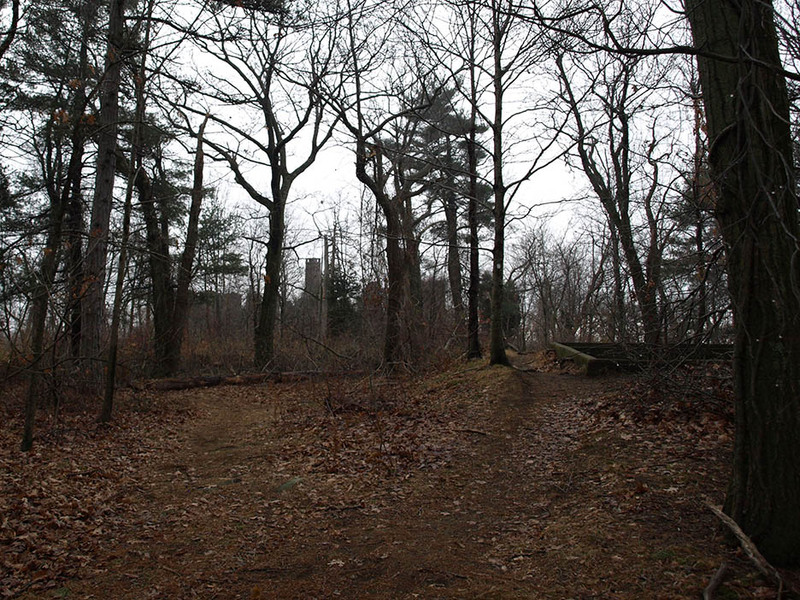 The trail soon reaches an exposed rock, where you can see a stone tower rising from the next hill. It looks cool in the fog too. 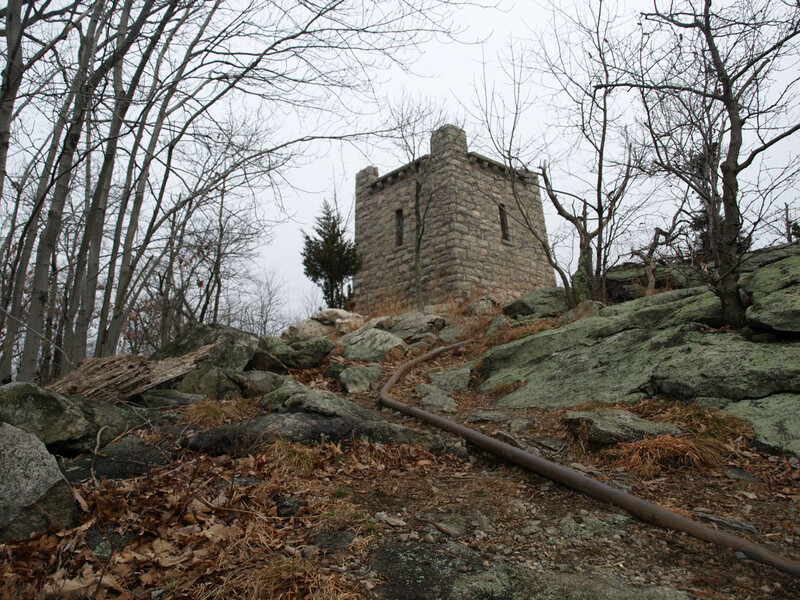 As you come up to the tower, you might think this is the castle that the trail name and the map are referring to. But more is to come. This tower once housed a water cistern. It’s difficult to tell if there used to be stairs or a ladder to the roof, but it would be silly if there wasn’t. There are still pipes sticking out of the tower. Then, the stone ruins of the main building are ahead. The concrete thing in the ground was once a swimming pool with a very steep floor. 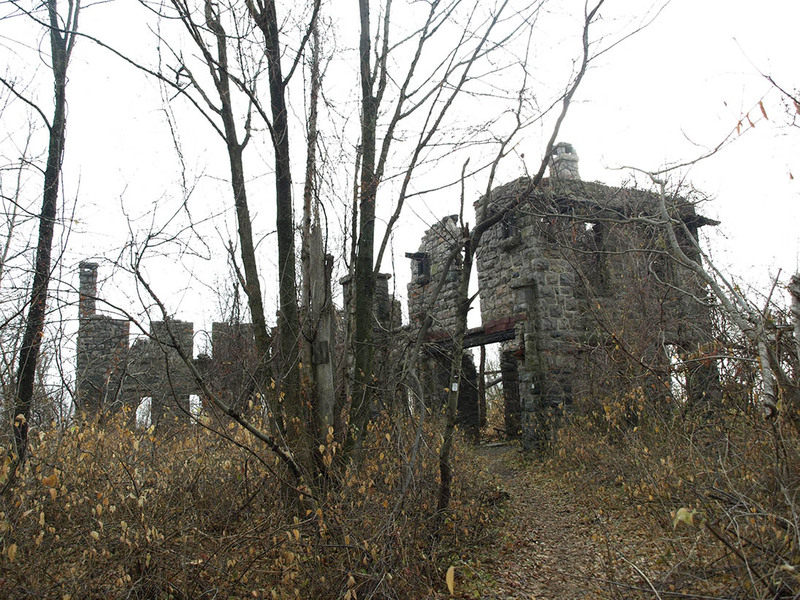 And now we arrive at the ruins of Foxcroft, which today is often called the Van Slyke Castle. Foxcroft was constructed from 1908 to 1909 for William Porter, a stockbroker, and his wife Ruth. It was made of rock taken from surrounding ridges and transported by mule and oxen. An account of the house from when it was inhabited describes the first floor as containing a living room, an “unusually large reception hall,” a dining room, breakfast room, kitchen and service rooms. The second floor had multiple balconies, “four master bedrooms and three baths, also servants’ rooms and bath.” There was also a garage and a chauffeur’s cottage with multiple rooms. Getting inside gives you a sense of how extensive this place was. Looking out a window you can see a tower on the hill to the east. We’ll get there later. Just a few years after Foxcroft was built, William Porter died in a vehicle accident. In 1913 Ruth married a prominent lawyer, Warren Van Slyke. Warren died in the 1920s but Ruth continued to live at Foxcroft until her death in 1940. 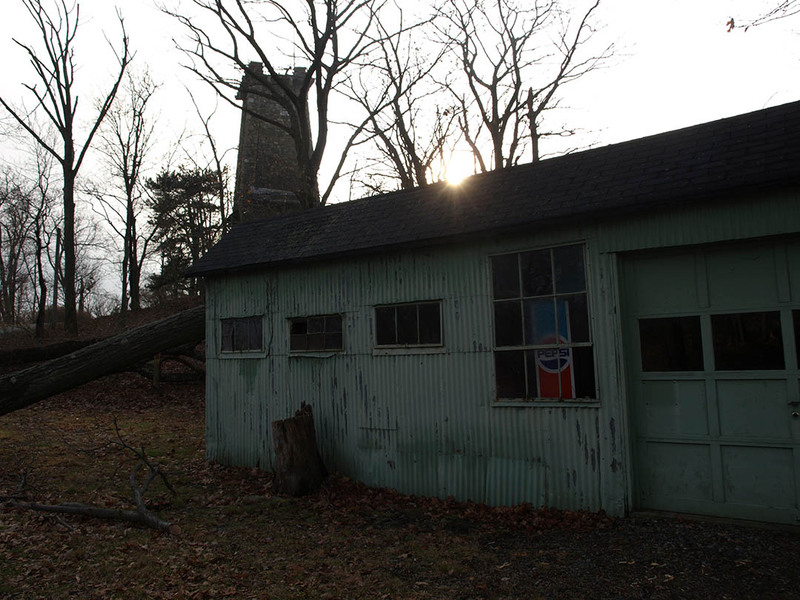 The property changed ownership several times in the 1950s and the abandoned mansion became a hangout for local youth. Sometime around 1960 the house was burned in a fire generally attributed to vandalism. On a clear day, the New York City skyline is visible when looking southeast from the ridge. 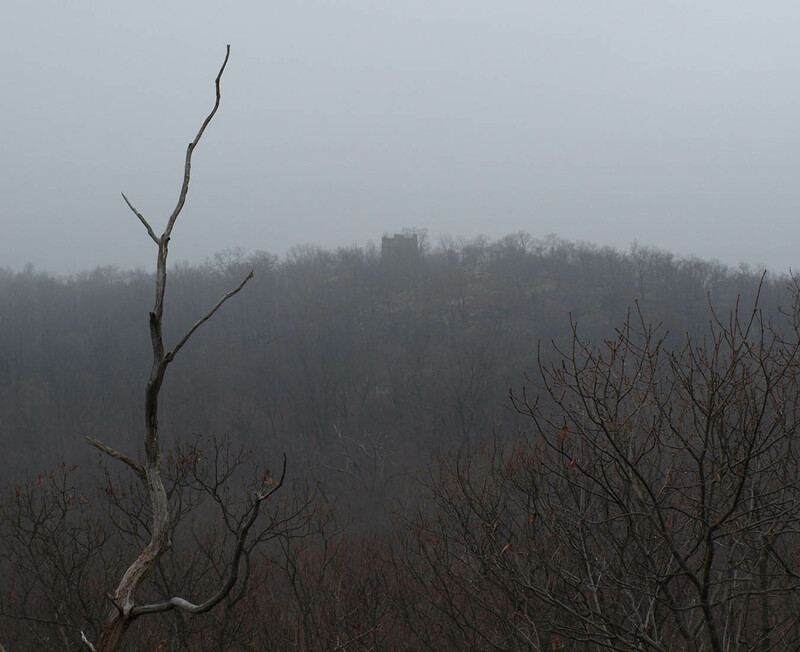 Today was not a clear day, but the view looking south over Ramapo Lake was nice. Castle point is a popular local hike, and there are some pictures of the ruins online. But not many people seem to think of climbing down the outer retaining wall. Which is probably why there aren’t many pictures of the tank room online. 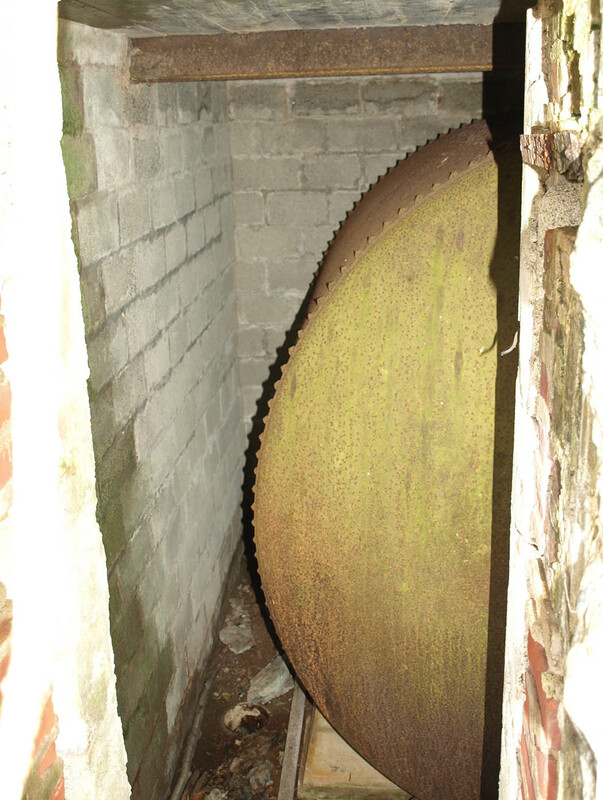 A hole in the side of the retaining wall leads to a brick room with a big rusty tank in it. I don’t know what it contained, but my guess would be heating oil. There is nothing behind the tank besides a space large enough to walk through. Whenever hiking, take care to leave things at least as good as you found them so other people have the opportunity to enjoy them like you did. The same goes for exploring ruins, which are sometimes fragile. Watch your feet and head too! After descending from the castle, we headed to the tower on Rye Cliff. 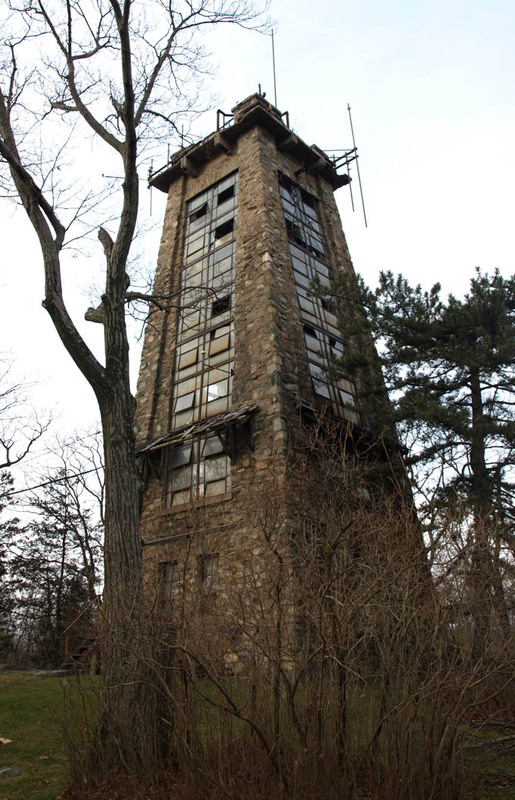 The tower is surrounded by private property, so it’s best to stick to trails and roads for this part. 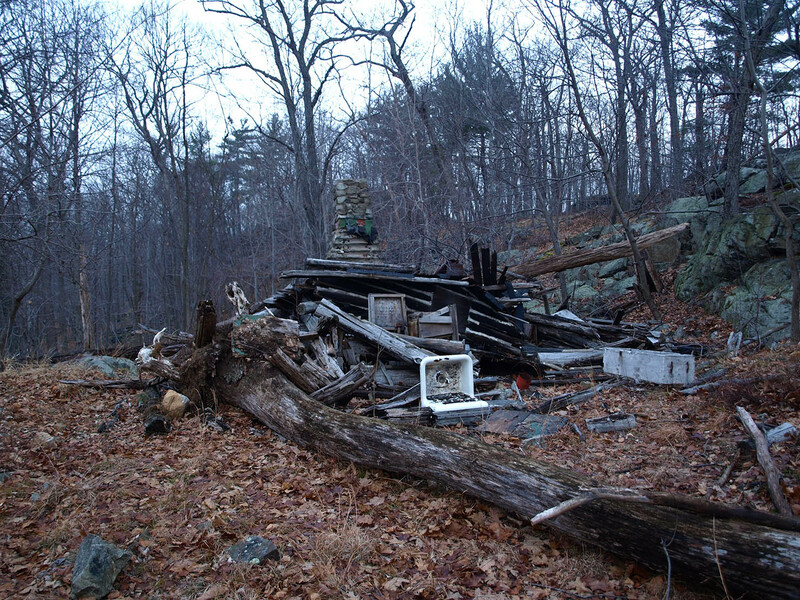 North of Skyline Drive, the Ramapo wilderness contains more trails and more ruins. If you’re up for venturing off the trail, following creeks can lead to interesting things. In this case, picturesque Lake Tamarack. Leaving things at least as good as you found them requires even more attention once you get off trail. Unfortunately, the ground near the shelter in the center of the picture was littered with broken bottles. 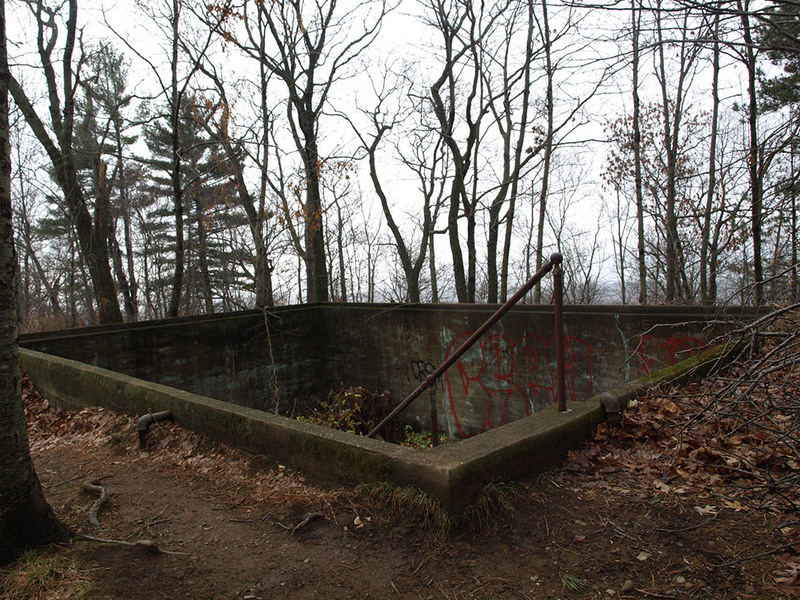 Camp Tamarack was a Boy Scout property purchased by Bergen County, so presumably the structures around Lake Tamarack were part of the camp. Along the shores of the lake are the remains of a collapsed building. 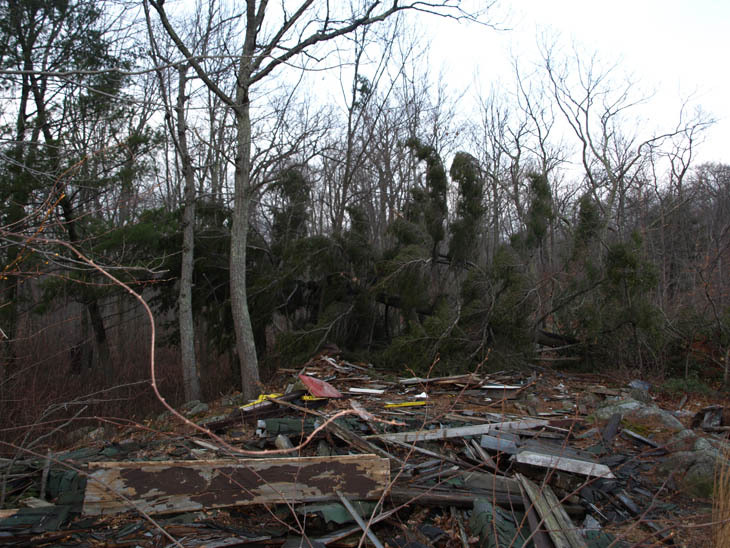 And on a hill just northwest of the lake is another collapsed cabin. These finds bring up an interesting question: what separates garbage from artifacts? The easy answer would be that artifacts are useful, but use is subjective. If ruins are likely to add to the visitor’s experience, then should they stay where they are or be put on display somewhere else? Should they be studied by professionals or left to be pondered by amateurs? 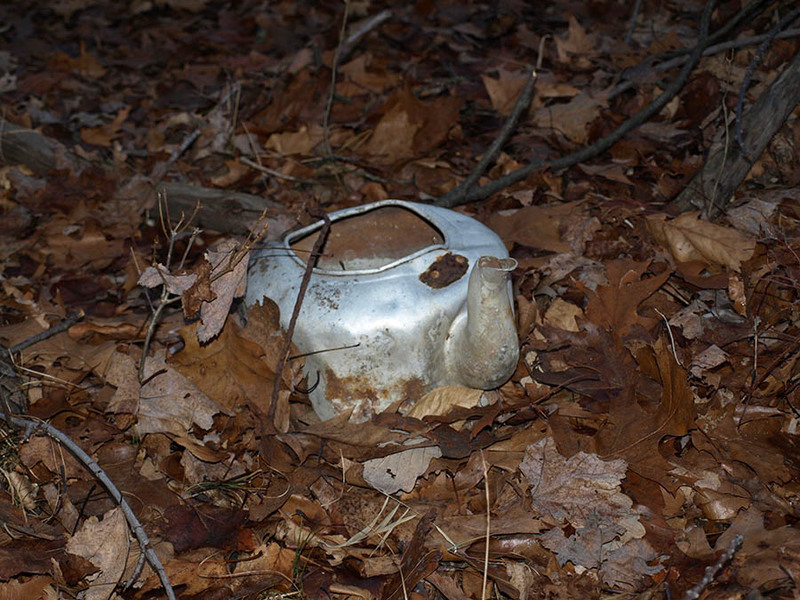 And another thing to contemplate: if your cabin is in the middle of the woods, would anyone know if you lost your mind and started throwing teapots around? All in all, an excellent hike. Happy adventuring! Daniel Chazin, Editor. New Jersey Walk Book, 2nd Edition. 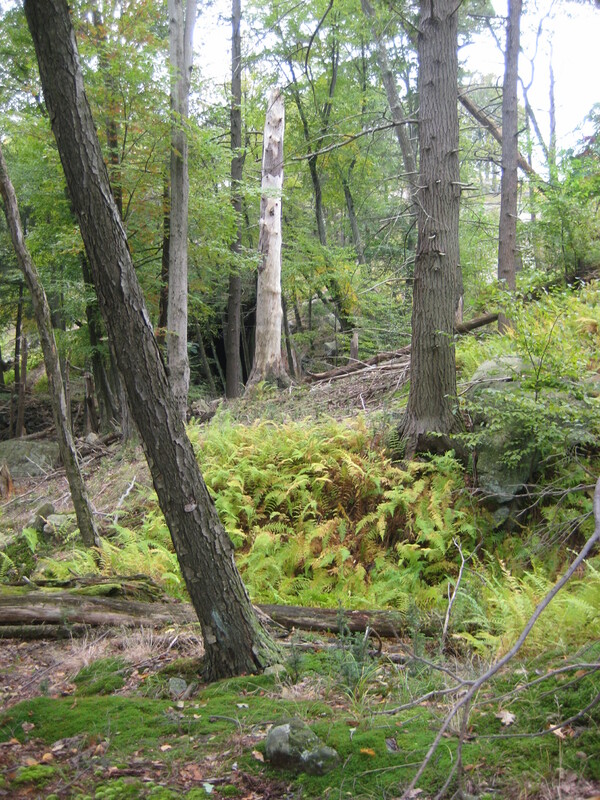 Mahwah, NJ: New York – New Jersey Trail Conference, 2004. 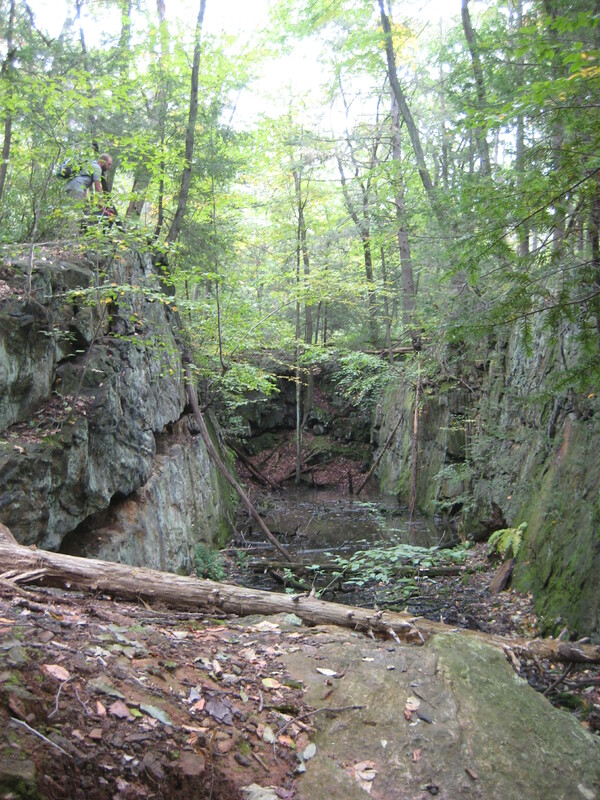 Pages 35-37, 67 (geology); 83 (Tamarack); 92-93 (Castle Point Trail and Foxcroft). Highlands Sites in New Jersey, Geology of National Parks, USGS. http://3dparks.wr.usgs.gov/nyc/highlands/ramapo.htm. Retrieved Dec 5, 2012. The Map we used is North Jersey Trails, Trail Map 115, New York – New Jersey Trail Conference, 9th Edition, 2009. Marriage Certificate of Warren C. Van Slyke and Ruth A. Porter (copy), Aug 7, 1913. Collegiate Reformed Protestant Dutch Church of the City of New York. Rich Moon collection. 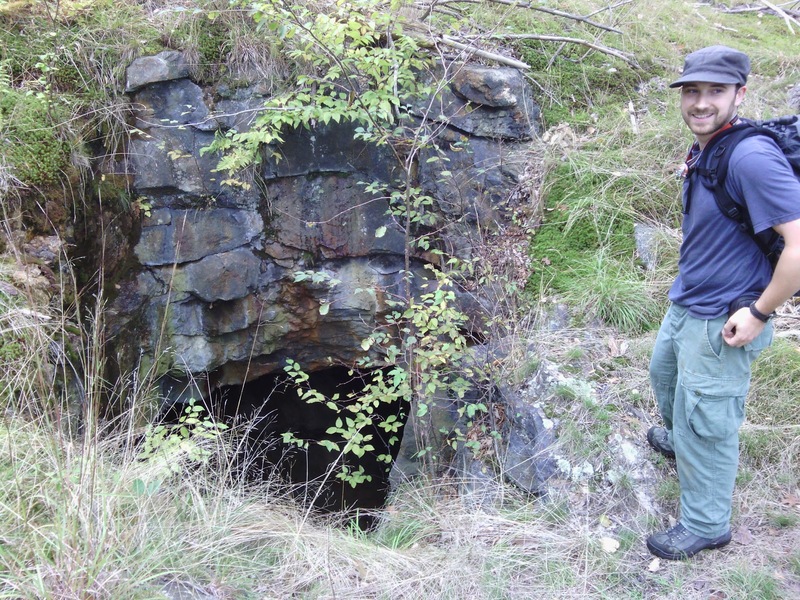 Those with an interest in the human history of the Ramapo Mountains should also be aware of the region’s mining history (north of the area covered here), as well as the Ramapo Mountain Indians and their struggles for recognition and against toxic waste dumping in abandoned mines. So we set out – Darian, Ryan, and an enthusiastic pit bull named Max – from the parking lot at Lake Skannatati to find out how interesting they were. The first mine we passed was marked on the map, but not named. It was basically a trench cut through the rock. A good starter. 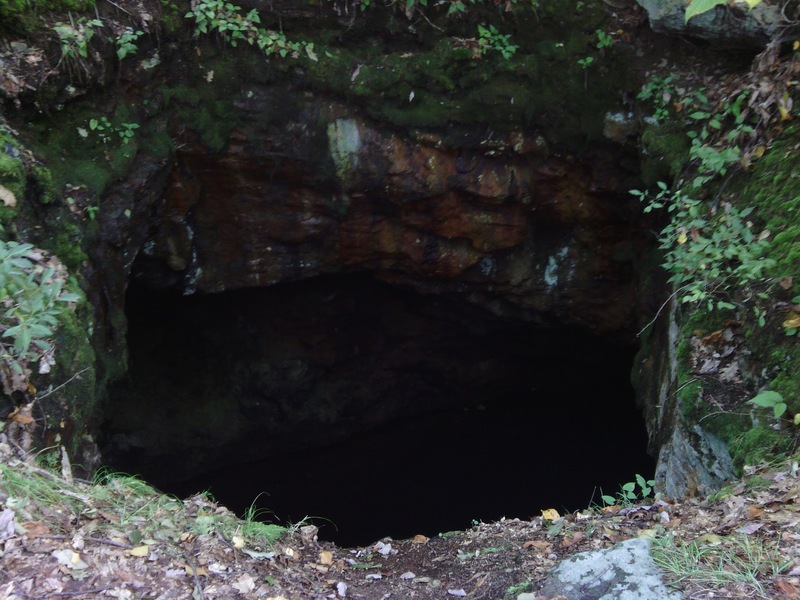 Next on our agenda was the Pine Swamp mine. 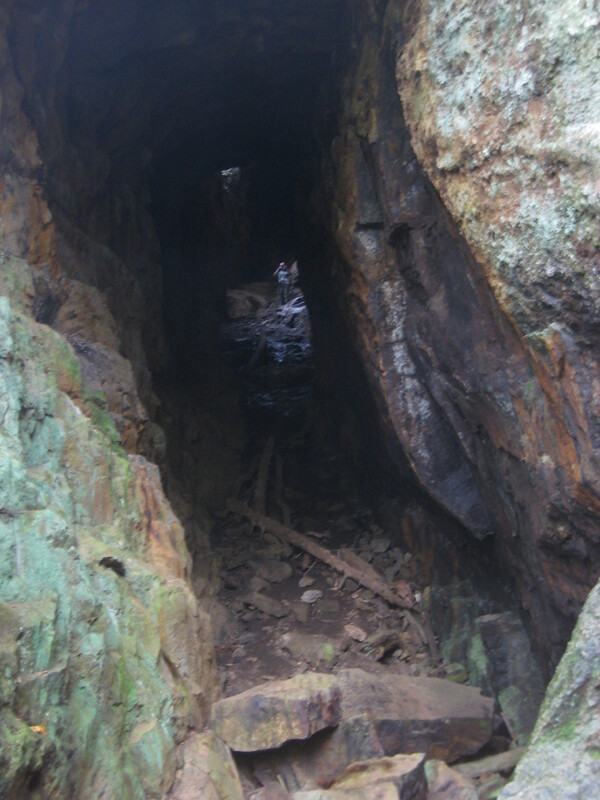 We first noticed a small open shaft cut into the rock just off the trail. Pretty cool. I climbed up the opposite side to a relatively flat area that looked like part of an old roadway. There was also a hole filled with water that looked to be an old mine hole. We decided to check out the area more. As we walked roughly parallel to the trail, we could see something dark behind the distant trees, a shadow that stuck out as deserving a closer look. As we got closer, we could see a trail of rock tailings (waste rock from mining) going across our path and toward the shadow, which was looking more and more like a big hole. A massive cut led to a shaft deep into the hillside. The floor of the shaft sloped upward so you had to climb as you went deeper. A light shined through a hole in the ceiling toward the end. 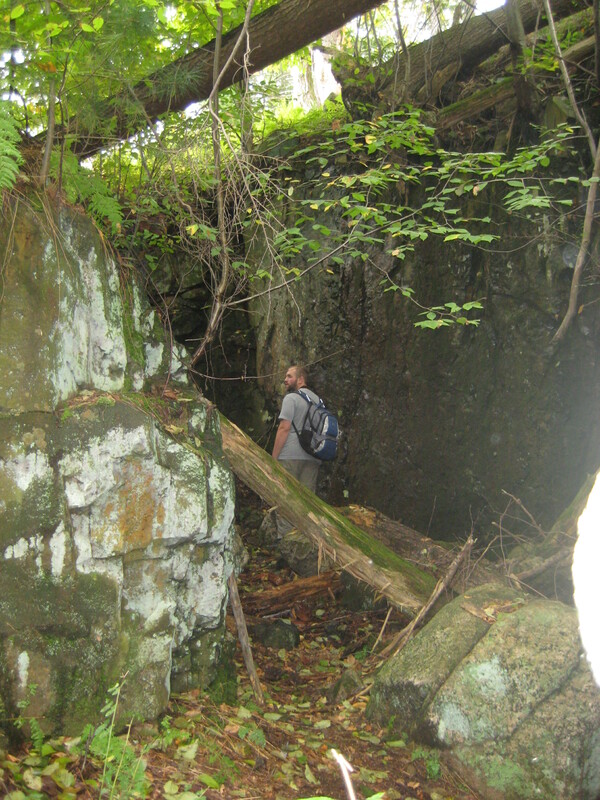 After leaving the shaft we did not venture down to the trail to see where it came closest to this mine opening. That was an oversight that could make this slightly harder to find next time, but it really wasn’t that difficult with the map. 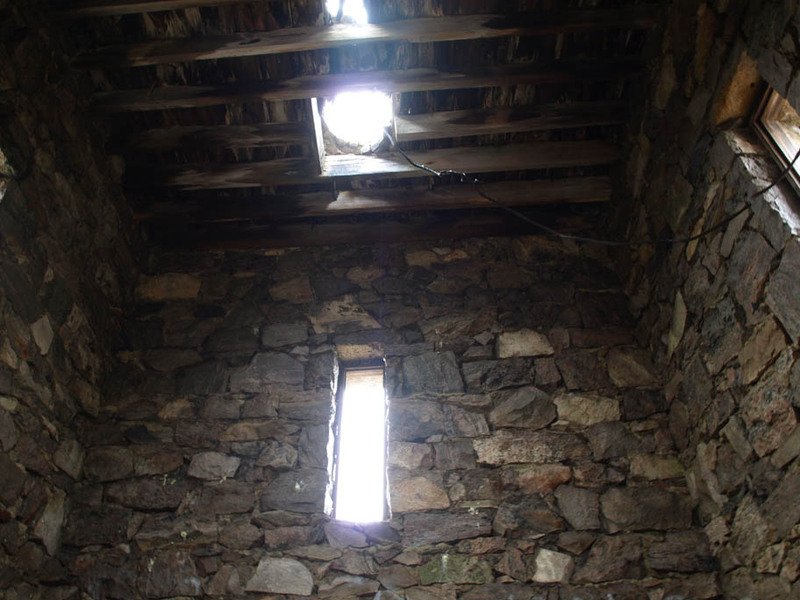 Instead, we climbed up the hill to find the ceiling hole. Definitely not something you want to fall in. Instead of falling in the hole, we climbed to the top of the hill and ate lunch. 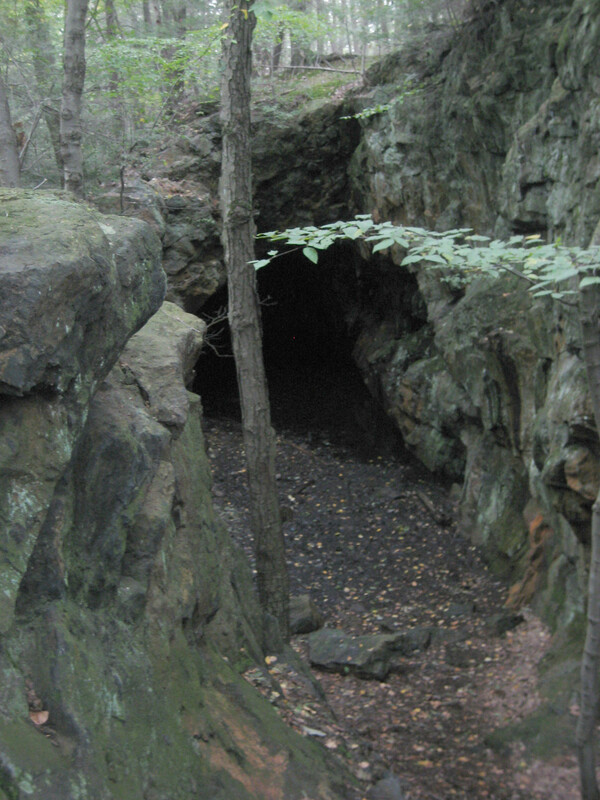 Most of the mines in the park were iron mines (presumably the one labeled Nickel Mine on the map was not). Around many of them the rust coloring of the surrounding rocks suggests that iron ore is about. After eating lunch we headed downhill toward our next goal, the Hogencamp Mine. I don’t know how to pronounce it, and I don’t know if I’d rather it sound like it has something to do with Hulk Hogan or with hogging. 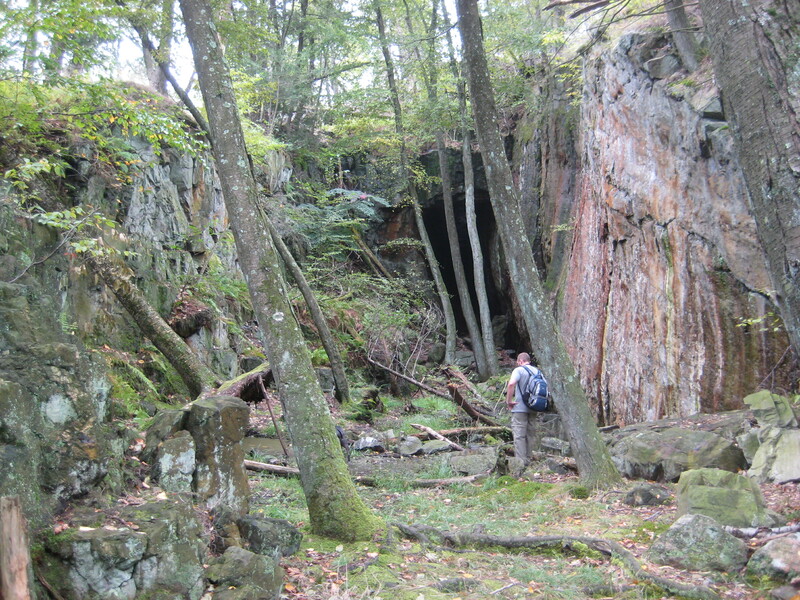 Right where the map suggested, there was a shallow trench that led to a small shaft into a rock face. Oh, and there’s also a huge pit with a black pool of water at the bottom. Don’t fall in that. Some depressions in the ground nearby looked to us like the result of sinking from a shaft cut underneath. The mine that I really wanted to get to because I had actually seen pictures of it was the Boston Mine. We quickened our pace and headed down the trail. It is a broad hole full of swampy water and mud. We could see the end so we didn’t bother trying to wade deep into it. Next time we’ll bring more lights and bigger lights so we can get better pictures. Even if we hadn’t seen any mines this still would have still been great trip. It’s rare to have a bad day for a walk and today was a particularly nice day for a hike. You can find a lot of cool stuff if you go out and look for it. Here’s to more adventures! 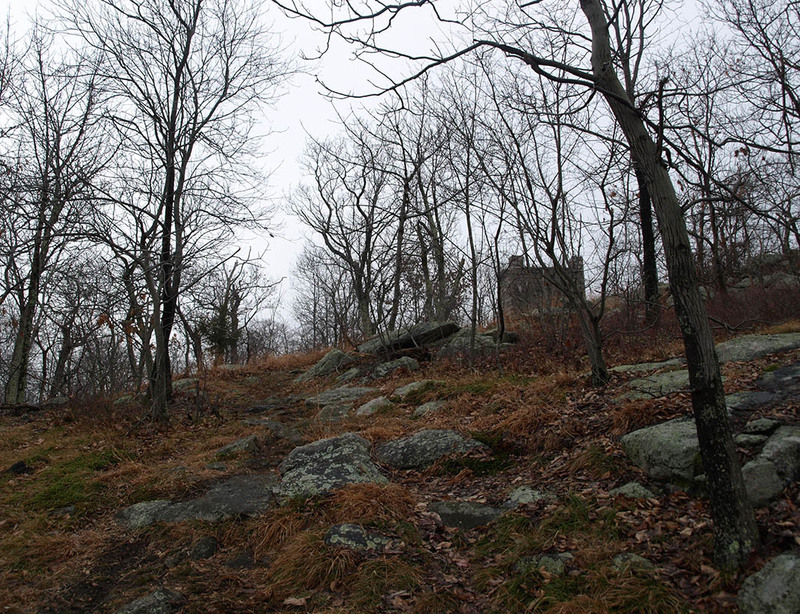 Trail Map 119: Northern Harriman Bear Mountain Trails. 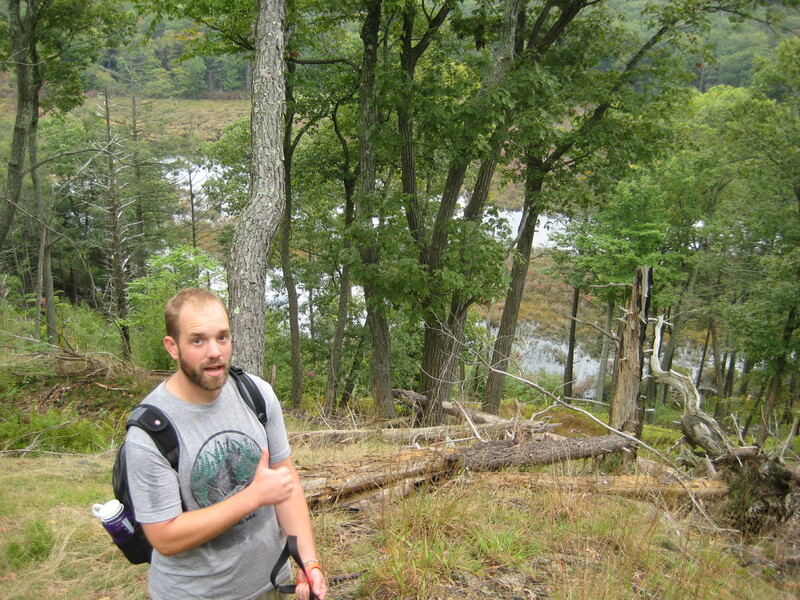 New York – New Jersey Trail Conference. We used the 12th Edition (2008). The latest is the 14th Edition (2012). Available at the NYNJTC website and many hiking stores in the area. William J. Miles and Daniel Chazin. 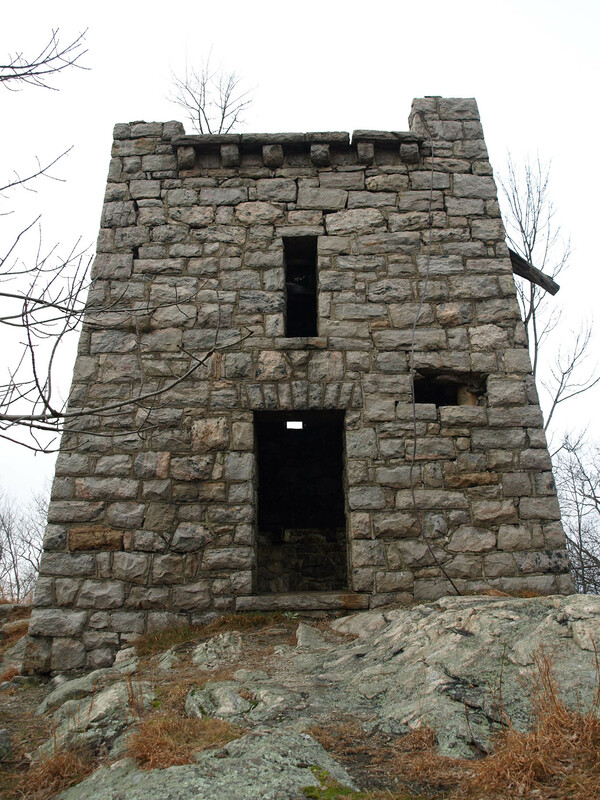 Harriman Trails: A Guide and History. 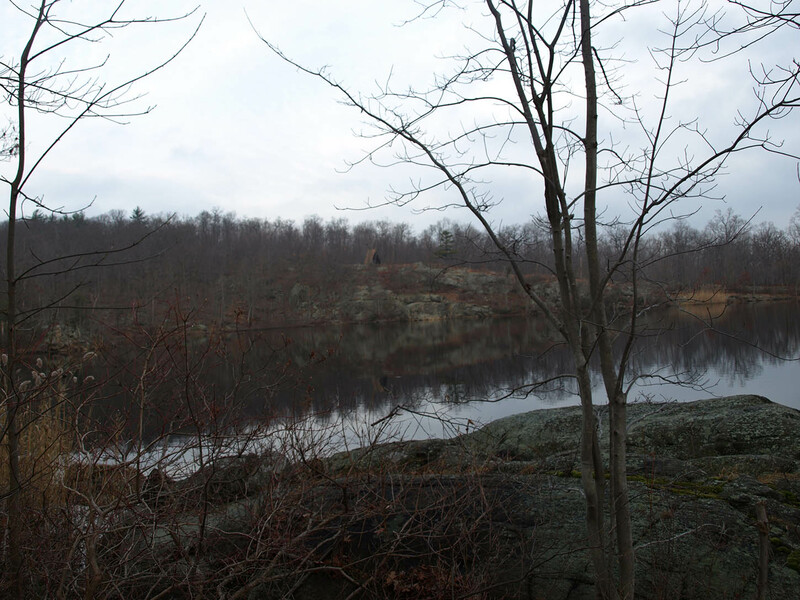 Mahwah, NJ: New York – New Jersey Trail Conference, 2010. Page 370. James M. Ransom. 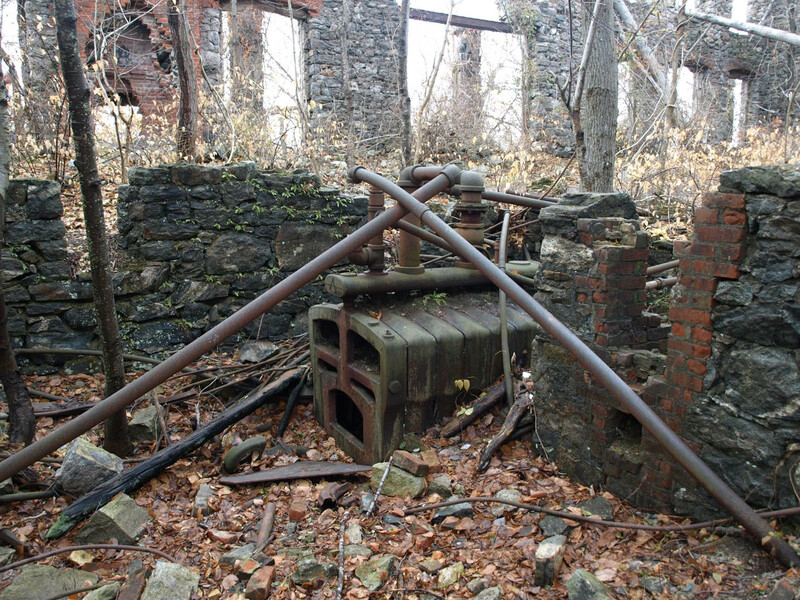 Vanishing Ironworks of the Ramapos: The Story of the Forges, Furnaces, and Mines of the New Jersey – New York Border Area. New Brunswick: Rutgers, 1966. Pages 143, 238-239. Greenwood No. 2 furnace, which opened in 1854, is also called the Clove Furnace. Ransom, Vanishing Ironworks, Pages 235-236. Ransom, Vanishing Ironworks, Pages 225-227. Ransom, Vanishing Ironworks, Page 231.